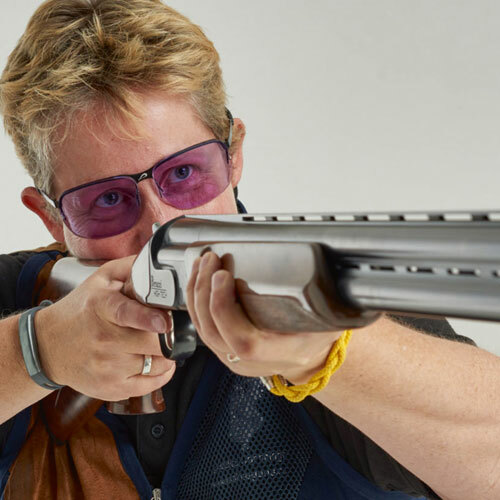 England trap shooter Kath Bright came to see me as she felt her vision was at times inconsistent. When shooting a game such as DTL, every second barrel takes a point off your score and if you miss a whole target, you may as well go home. Whilst often shooting very well indeed, there were certain times that the vision in her right eye would go blurred and the left eye would appear to take over. The problem lay with her contact lenses. Kath, like many people, has a small amount of “astigmatism”. This means that the eye is not spherical like a football, but is more rugby ball shaped. If astigmatism is not corrected, or is corrected wrongly, it often causes distortion of round, fast-moving objects. Not ideal for clay shooting! Contact lenses by their nature are dynamic, and move around on the eye. For a contact lens to correct astigmatism properly, it must sit in one particular position (axis), say 12 and 6 o’clock. Most “toric” lenses are designed to sit nicely on the cornea when looking straight ahead in day to day wear, although some rotation can happen. Combine a trap shooting eye position, fast moving targets with a contact lens that is very axis sensitive and the inevitable happens – blurred vision! As such, we decided to move her out of contacts and into a full prescription spectacle, using the very popular Pilla 580 product, to ensure consistent, accurate vision at all times. Not too much time later, Kath entered the Clay Shooting Classic DTL Championship at Bywell Shooting Ground in August 2016 where she had to shoot-off to win the Ladies category 25/75, then shoot-off against the other category winners (Colt, Junior and Veteran), which took two rounds of 25: 25/74 and 25/75. This qualified her for the Super shoot-off against the class winners (AA, A, B and C), in which she shot 25/74 in to win the a Perazzi High Tech! A great result all round.